First prepare the roasted vegetables: prepare the aubergine and courgettes ahead of time by cutting them into 1 inch (2.5 cm) dice, leaving the skins on. Then toss the dice in a level dessert spoon of salt and pack them into a colander with a plate on top and a heavy weight on top of the plate. Leave them on one side for an hour so that some of the bitter juices drain out. After that, squeeze out any juices left, and dry the dice thoroughly in a clean cloth. Preheat the oven to gas mark 9, 475°F (240°C). Now arrange the aubergine, courgettes, tomatoes, pepper, fennel and onion in the roasting tin, sprinkle with the crushed garlic, basil and olive oil, toss everything around in the oil to get a good coating and season with salt and pepper. Place the tin on the highest shelf of the oven for 30-40 minutes or until the vegetables are toasted brown at the edges. When the vegetables are done, remove them from the oven and stir in the chopped olives and the capers then remove them to a plate to cool. When you’re ready to assemble the salad, first place the couscous in a large, heatproof bowl, then pour the boiling stock over it, add some salt and pepper, stir it with a fork, then leave on one side for 5 minutes, by which time it will have absorbed all the stock and softened. Meanwhile cut the cheese into sugar cube-sized pieces. Make up the dressing by whisking all the ingredients together in a bowl, then pour into a serving jug. 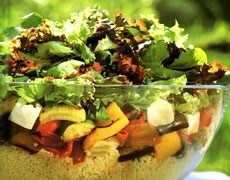 To serve the salad, place the couscous in a large, wide salad bowl and gently fork in the cubes of cheese along with the roasted vegetables. Next arrange the salad leaves on top and, just before serving, drizzle a little of the dressing over the top followed by a sprinkling of onion seeds and hand the rest of the dressing around separately.